The Mediterranean Sea is one of the areas most affected by marine litter worldwide. Marine litter is found lying on the shores, as well as floating anywhere from the surface to the bottom of the sea. Even in pristine environments of the Mediterranean, such as coastal and marine protected areas, marine litter is building up threatening habitats and species. Impacts vary from entanglement and ingestion, to bio-accumulation and bio-magnification of toxics released from litter items, facilitation of introduction of invasive species, damages to benthic habitats, etc. MPA managers stand at the forefront of this issue and sadly they lack the tools, knowledge, and often the resources to effectively tackle it. As a result, the achievement of the conservation goals set is hampered. Wanting to dig deeper into the amounts, types and sources of marine litter deposited on the beaches of coastal and marine protected areas in the Mediterranean, the Interreg Med ACT4LITTER project set up a participatory-science campaign entitled ACT4LITTER Marine Litter Watch Month and assessed beach litter in a large number of locations in a consistent and harmonized way. 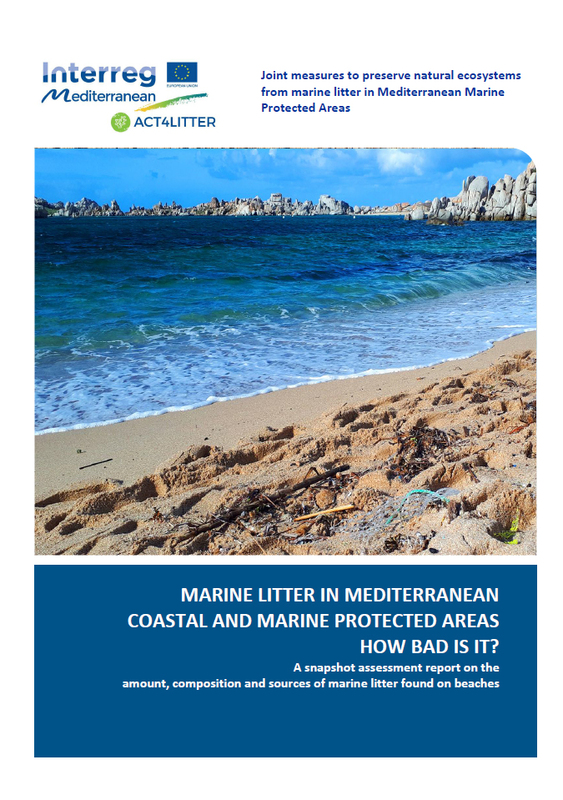 The results and findings provide fit-for-purpose data for the effective management of marine litter in Mediterranean coastal and marine protected areas. The ACT4LITTER Marine Litter Watch Month is a participatory-science showcase, where MPA managers have become a taskforce that provides reliable, accurate and comparable marine litter data. The project provided a set of carefully designed and piloted? webinars to enhance the managers’ skills on how to monitor marine litter by using a standardized beach litter monitoring protocol. The ACT4LITTER Marine Litter Watch Month has altogether connected some 20 MPA management bodies, NGOs and other organizations, which joined forces in order to shed light on the marine litter threat in Mediterranean coastal and marine protected areas. It was launched in 2018 and counts to date 4 editions (winter, spring, summer, autumn). The initiative will carry on within the framework of a follow-up project, namely the Plastic Busters MPAs, also funded by the Interreg Med.